Throughout California, customers are switching to Time-of-Use pricing plans. These plans give you more choice and control for managing your energy use. With these plans, prices will be lower all day except between the hours of 4 p.m. and 9 p.m. when prices are higher. Meet SDG&E's resident Time-of-Use expert Whendell. With the new Time-of-Use pricing plans, your energy costs will be based not only on how much energy you use, but also when you use it. Energy prices will be lower all day, except between the on-peak hours of 4 p.m. and 9 p.m. when prices are higher. This new approach to pricing gives you more choice and control over your energy costs. Use the information below to learn more about Time-of-Use plans and select the plan that best fits your household’s needs. The choice is yours. You can make your pricing plan selection today. Then click on “Compare Pricing Plans” to review your options. Note: the “Compare Pricing Plans” section will show several plan options for you, some of which may not be Time-of-Use or have one-year no risk pricing. If you are a Net Energy Meter customer, the cost comparisons will not reflect your true up amount. Visit sdge.com/solar for more information. When you use energy is as important as how much you use. With Time-of-Use pricing plans, energy prices are different based on the time of day. Energy costs are lower during the off-peak and super off-peak (TOU-DR1 only) time periods and highest only during the on-peak period. Here are two Time-of-Use pricing plans for your home. The choice is yours: TOU-DR1 and TOU-DR2 include one year no-risk pricing, meaning you can try these plans RISK-FREE for up to one year and if you end up spending more than you would have on your previous plan, we will credit you the difference. You can also switch to another available plan at any time. Learn more about opting out of Time-of-Use pricing plans. Although most residential customers will move to Time-of-Use plans in 2019, not all customers will be impacted by the transition. Learn more about exclusions. This plan includes more than three lower-cost time periods before 4 p.m. and after 9 p.m. The TOU-DR1 plan breaks your day into three periods: on-peak, off-peak and super off-peak. Prices are lower before 4 p.m. and after 9 p.m.
You can switch to another available pricing plan at any time. The off-peak and super off-peak hours change by weekdays, weekends and holidays to give you more super off-peak prices. There is no High Usage Charge with the TOU-DR1 plan. The TOU-DR1 plan comes with bill protection. Try this plan for up to one year. If you end up spending more than you would have on your previous plan, we’ll credit you the difference. Bill Protection is not available for accounts opened after 2/28/19 or NEM-ST customers. Save by keeping your energy use below 130% of your total Baseline Allowance and shifting your energy use to off-peak hours. This plan includes two lower-cost time periods before 4 p.m. and after 9 p.m. The TOU-DR2 plan breaks your day into two periods: on-peak and off-peak. 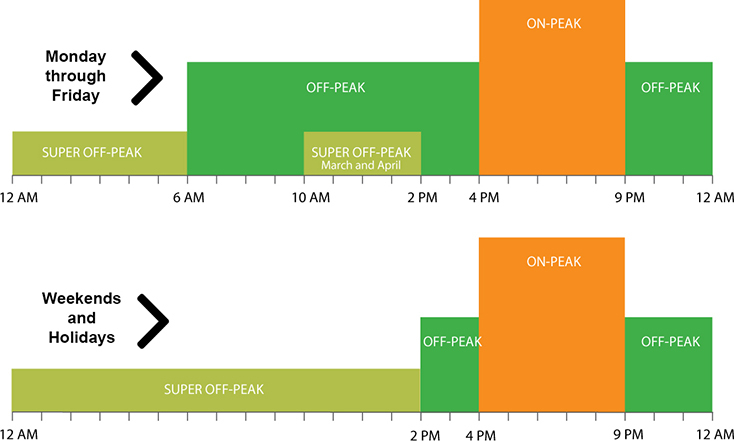 The on-peak and off-peak hours stay the same every day of the week. There is no High Usage Charge with the TOU-DR2 plan. The TOU-DR2 plan comes with bill protection. Try this plan for up to one year. If you end up spending more than you would have on your previous plan, we’ll credit you the difference. Bill Protection is not available for accounts opened after 2/28/19 or NEM-ST customers. Save by keeping your energy use below 130% of your Baseline Allowance and shifting your energy use to off-peak hours. In addition to the plans above, you may be eligible for the Time-of-Use Plus pricing plan. This plan may be an option if you can commit to reducing energy on Reduce Your Use event days. The Time-of-Use Plus plan breaks your day into three periods: on-peak, off-peak and super off-peak and includes Reduce Your Use event days. Prices are lower year-round except on Reduce Your Use event days, when prices are higher between the hours of 2 p.m. and 6 p.m.
Up to 18 Reduce Your Use event days can be called each year, typically in the summer when demand for energy is higher. Other than on Reduce Your Use event days, the on-peak hours are 4 p.m. to 9 p.m. Both the TOU-DR1 and TOU-DR2 pricing plans come with a one year no-risk pricing option, meaning you can try one of these plans RISK-FREE for up to one year, and if you end up spending more than you would have on the Standard (DR) plan, we’ll credit you the difference. You can follow along on your bill on the Your Electricity Dashboard page. Look for “1 Year No-Risk Pricing” to see how you’re performing on Time of Use and compare with the Standard pricing plan. *Not available for accounts opened after 2/28/19 or NEM-ST customers. Knowing your baseline means knowing the basic monthly allowance of energy you can get at the lowest price. Your baseline is determined by where you live, season, number of days in your billing cycle and whether you have just electricity or both gas and electricity. Time-of-Use works in combination with baseline. Energy prices have a time period component and a baseline component. Here are the current winter prices for the Standard pricing plan and the Time-of-Use pricing plans. Learn more in this overview of Time-of-Use pricing plans. Time-of-Use pricing is based on when you use energy, not just how much you use. No matter the size of your household, small changes in the way you use energy can help reduce your energy bill. There are many ways to save throughout your entire home. Here are some examples. All pricing plans (rates) are subject to the supervision and regulation of the California Public Utilities Commission (CPUC) and are subject to change by CPUC order. One Year No-Risk Pricing is applicable for up to 12 months while on TOU-DR1 and TOU-DR2 and does not apply to customers with NEM-ST.
For the average household, about 5 percent of its energy bill is dedicated to lighting. When it comes to energy efficient lighting, there are many choices. Look for light-emitting diodes (LEDs), compact fluorescent lamps (CFLs) and halogen incandescents. For outdoor lighting that is left on for long periods of time, use CFLs or LEDs as they will save energy. Replacing your home’s five most frequently used light fixtures or bulbs with ENERGY STAR ® rated models could save you $45 a year. Have a lot of electronics that need to be plugged in or charged? On average, the typical U.S home now has almost 30 electronic products. Most of which need to be plugged in or recharged. Turn off these products when not in use or use a power strip as a central point to turn off when you’re finished. Make sure to unplug any battery chargers or power adapters when electronics, like phones, are fully charged or disconnected from the charger. Screen savers for computers save your screen, but don’t save energy. Make sure the screen saver does not deactivate your computer’s sleep mode. You can set the computer to operate the screen saver, then go into the sleep mode. If you aren’t going to use your computer for more than 20 minutes, turn off your monitor. If you aren’t going to use your computer for more than 2 hours, turn off your monitor and central processing unit (CPU). It takes more energy to have your computer running than the energy it takes to start it. Water heating is the second largest energy expense in your home, second only to heating/cooling. There’s a spectrum of options whether you’re able to cut out those extra few minutes in the shower or washing your clothes in cold water to investing in a new energy efficient water heater. Start here for more options: https://www.energy.gov/energysaver/heat-and-cool/water-heating. Check out the rebates available at sdge.com/rebates. Before using your dishwasher, be sure it’s full but not overloaded. Many dishwashers have an option for “air drying” or “heated drying.” The air-drying setting will use less energy. Consider running your dishwasher before 4 p.m. or after 9 p.m. If you’re in the market for a new dishwasher, look for one with the ENERGY STAR® label as they are almost 10% more energy efficient than the current federal standards. Have a portable A/C or window unit? If possible, purchase an ENERGY STAR ® rated room air conditioning unit. They are 5-10 percent more efficient than current federal standards. If you’re using the unit to cool a bedroom before sleeping, waiting until after 9 p.m. to start cooling for the night can help you save money. You can save as much as 10 percent a year on your energy bill by turning your thermostat back 7-10 degrees for 8 hours a day from its normal setting. Installing a programmable thermostat in your home will let you automatically adjust the temperature during on-peak hours. Check out the rebates available at: https://sdge.com/rebates . Have an in-home washing machine? If you’re in the market for a new washer, look for ENERGY STAR® washers. They typically use 20% less energy than washers that meet the minimum federal standards and use 30% less water than their non-ENERGY STAR counterparts. Consider scheduling your laundry before 4 p.m. or after 9 p.m. Check out the rebates available at sdge.com/rebates. We have pricing plans specifically for electric vehicle drivers, including a plan just for charging your electric vehicle or if you prefer, plans for both your home and electric vehicle. Start here: sdge.com/evplans. A variable speed pump can reduce energy use by 30-45%. In addition, a heat pump can save up to 80% in energy use compared to a gas heater. Whendell, our resident expert, answers your most frequently asked questions about Time-of-Use pricing plans. Will I save money with Time-of-Use pricing plans? Why do I have to move to a Time-of-Use plan? What impact will Time-of-Use plans have on my bill in the summer? How am I supposed to stop using energy between 4 pm and 9 pm? Is Time-of-Use pricing just another way of increasing prices? What do I need to do with Time-of-Use? Not every SDG&E customer will automatically transition to Time-of-Use. However, if you are transitioning automatically, then you will receive direct mail and/or email from us about the upcoming change, complete with the date you are scheduled to move to a Time-of-Use plan. These communications will be sent to you over a three-month time frame and include a postcard and two customized communications with pricing plan information and options to select from before you transition. Do nothing and we’ll automatically move you to a Time-of-Use pricing plan on the date listed in your personalized letter and/or email. Enroll now in Time-of-Use ahead of your scheduled transition date that is listed in your personalized letter and/or email. Elect to stay on your current plan. If you choose to enroll early, select a different Time-of-Use plan, or remain on your current plan then you would need to either send back the reply card that came with your direct mail package or go to sdge.com/planenroll and make your selection there. You can even make a selection after you have already transitioned to a Time-of-Use plan. You can try a new Time-of-Use pricing plan risk-free for up to one year. If you end up spending more than you would have on the Standard (DR) plan, we will credit you the difference. Please note that 1-year no-risk pricing is not available to some solar customers (NEM-ST) or accounts opened after 2/28/19. There are certain categories of customers who are not transitioning automatically to Time-of-Use (learn more about exclusions). These customers too can elect to be enrolled in a Time-of-Use plan. It is available for every residential customer. The only difference is they don’t need to take action to remain on their current plan. When will I switch to Time-of-Use pricing? Three months prior to transitioning to Time-of-Use, you’ll receive a postcard in the mail (and an email if we have your email on file) to notify you of the upcoming change. In addition, customized communications containing information on your pricing plan options and tips to help you save will be sent to you 60 and 30 days prior to your transition. Why has my neighbor switched to Time-of-Use and I haven’t? You may transition to Time-of-Use pricing at a different time than your neighbors. We are phasing the transition for different customers over one year to ensure we can provide detailed customer service to customers as they move to their new plan. What if I want to switch to Time-of-Use now? Make your selection of a Time-of-Use plan at sdge.com/MyAccount, then click on “Compare Pricing Plans” to review your options. You can make your selection by clicking on “Enroll in This Plan." It takes a few minutes to complete this process. I have a solar or wind system and am on a tiered pricing plan. Will I be migrated over to Time-of-Use? Yes, you will be transitioned but it depends on when you activated your system. In general, if you activated your system before June 29, 2016 (called “NEM 1.0”) you can choose to remain on the tiered plan until the 20-year system anniversary date or as long as the plan is available. If you installed a system after June 29, 2016 but before March 30, 2018 (called “NEM 2.0 or NEM-ST”) then you will transition to a Time-of-Use plan either at the 5-year system anniversary date or in June 2021, whichever comes first. If you installed a system after March 30, 2018 then you are already on a Time-of-Use plan and will not be transitioned to another one. Beginning March 1, 2019, new NEM customers are automatically placed on TOU-DR1, unless another option is selected. I have a solar or wind system and wonder if one pricing plan is more cost effective than another? You made a great decision to get a solar or wind energy system. When it comes to your pricing plan options there are a few items to consider, including overall energy usage, size of your system and the date your system was installed. Most importantly think about your monthly usage and your household habits. If you are able to shift some of your energy use outside of the hours of 4 p.m. and 9 p.m., a Time-of-Use plan may work for you. If you own an electric vehicle then one of SDG&E’s electric vehicle Time-of-Use plans could be even better for you.